Parliamentarians in the recently-refurbished House of Assembly building in Road Town. 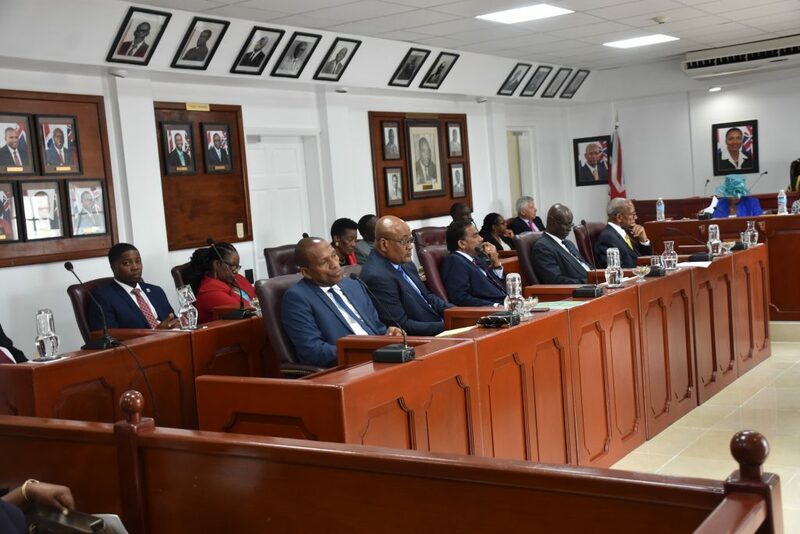 Premier Dr D Orlando Smith is receiving serious opposition from members of his Government, and at least four of those members have momentarily aligned with the parliamentary Opposition. Government backbenchers Delores Christopher, Melvin Turnbull, Archibald Christian, and Alvera Maduro-Caines have all collaborated with Opposition member Julian Fraser in a protest letter to the Premier. Fraser publicly read the letter during Thursday’s sitting of the House of Assembly. The letter stated that the UK-mandated Agency was purporting to take control of government’s finances. The parliamentarians went on to note that they were ‘protecting’ the future of Virgin Islanders. They subsequently recommended that government borrow from local lenders to finance the BVI’s recovery plan. But, those were not the only qualms the aforementioned Government and Opposition members expressed in their letter to Dr Smith. They accused the government leader of operating with a “blatant lack of transparency”. “Our concerns are enlarged by the fact that much activities in ministries and departments have already begun without the knowledge and consent of ministers who constitutionally hold responsibility for those subjects,” the letter said. Who is voting for the Agency? Meanwhile, Christian and Christopher were the first government ministers to publicly speak out against the Premier and his touted Recovery Agency, which must be approved in the House of Assembly for it to be implemented. With Government members Turnbull and Maduro-Caines added to the fold of Agency naysayers, the unofficial tally of parliamentarians who object to the Agency stands at six. That tally comprises four government members and the two Opposition members. A total of 13 legislators make up the House of Assembly. By the looks of things, the Premier should get full support from the other four At-large government ministers. Additionally, Government backbencher Hubert O’Neal has already stated his support for the Agency – making him the sixth legislator that may vote in the Premier’s favour. Barring any legislator abstaining from voting for or against the Agency, it seems government backbencher Marlon Penn may be the swing vote. And if the House of Assembly fails to agree to establish the Agency, the BVI will miss out on the United Kingdom’s offer of a £300 million loan guarantee. The debate on the Recovery Agency began yesterday and continues in the House of Assembly today, March 23. I certainly intend to remember those names when it comes to casting my votes at the next election. I cannot and will not support members of the House who stand in the way the Territory’s recovery. If the BVI doesn’t get those loan guarantees, all kind of h**l is going to break loose. And we will know who to blame. Would you subscribe to something without having full details. You people are so blinded by the guarantee figure that you all are being slack. I applaud them for standing up. No one would get me to sign off on anything on this basis. If it is that deal or no deal, then I take that deal. No question. No I definitely won’t, BUT, I would propose a viable alternative. Everyone agrees the Territory needs lots of funding and NOW to rebuild or else we are in trouble. Just saying “NO!” doesn’t help any one and we will find out the hard way. yourself- Irma has shown god’s anger with the BVI. It is now time to repent and by honest and open about the level of corruption in the BVI. A vote against recovery is a vote against the Good Lord Almighty himself. Who sleeps with the devil, spawns eternal hell fire. Perhaps we can borrow from the bank of God or pray that someone will look after us as we can’t seem to manage that for ourselves. Look around you, so many simple things that haven’t been fixed in over 6 months. We desperately need help. They have all the details, so please don’t let them fool you with their poli-tricks! The British Goverment is providing the gurantee for the loan and I agree the should also take control of the finances and how it is spent. Those who suggest that you should get the loan from local sources are to me looking to help t——-s not the territory. The BRITISH GOVERMENT is correct their funds and gurantee they should decide how its spent. exactly brother–if not our guys woud like to buy expensive cars for all legislators[sun hot] plus a minister in gov’t should be a dignified person driving in expensive cars etc etc who will lend us with such low interest rates? these no sayers have any thing to offer as an alternative ? @Albion, are you one waiting on your piece of the pie or you truly care about recovery. How can you support this piece of legislator without the full picture. All they want is oversight. Oversight is a good thing. Especially the way Governments in BVI behave with money. Or it can be seen that this Agency is taking control from HoA and putting it in the hands of just a few (usual suspects). We’ve had a bad experience when the few control large funds. Social Security. Social Security. Social Security. That’s all he thinks of and that’s all he says, that’s the only solution he knows in time of trouble…Eat up our retirement bread… Start think boss. Find another way or vote for this thing.. If the Assembly rejects this UK loan guarantee framework it will be a vote to impoverish the Territory, so a small minority can continue to operate in the dark, at the expense of everyone else here. The alternative local lender is the Social Security fund; that’s every one’s contributions for pensions etc. How can it be right to spend that the way government has spent money in the past? Look at the roads, the sewerage system and the schools! How will it be repaid if tourism reduces and financial services goes, because the infrastructure is too poor sustain them? Get real for God’s sake. I couldn’t agree more. This government has no transparency and the UK is in its rights to ask to oversee. We can’t do this alone. We need their help and I don’t trust this government to spend the funds wisely. Oversight is the thing to do. …or any other government coing in. We need help managing this loan. Other monies have disappeared under both government, with no honest answer for how the money was spent. The general feeling is thsat it resides in someone,s pocket or purse. That is NOT good. Oversite is not a bad thing, give an opportunity it makes all parties accountable. If back benchers could be fired they need to be fired. How are we going to get our country fixed without loans? We voted for you to find solutions not to be cry babies. How will Delores, Mitch and Alvera get their districts fixed without money? Mitch was making the most noise about not getting help to clean up his district but now he is voting against the only way to get his district fixed. These people are playing too many games while we the people suffer. I am remembering these names as well for election. Archie is out now for sure in my book. Give the Districts Reps the true picture. As you had it Archie was out more than four years ago. The recovery of BVI has nothing to do with who the leader of the territory is, I’m sure if you knew what was going on behind the scenes Dr Smith is doing the best he can……BVI just doesn’t have enough money! The biggest problem with this recovery/rebuild is the archaic and entitled mentality of an entire country. Your country was 30yrs behind the rest of the world preIrma. …….Allow outside investment. Allow expats to open businesses. Allow expats to buy the land. This will stimulate your economy and your quality of life too. Right now professional people are leaving and it will be hard to recruit new ones to a dilapidated country. BVI needs qualified professionals to survive or it will turn into more of a 3rd world country than it is right now. Bvi is beautiful, share it instead of treating the people who are actually choosing to be there so poorly. Expats already have businesses and own too much of our land. To think that the problems would be solved by turning over our country to settlers is demonstrative of a very racist point of view. Yes. Racist. Ummmm. First off ‘your’ ancestors were not originally from BVI either at some point they moved there….that’s the way the world works. Secondly my statement is the furthest thing from racist….FYI expats come in all colors. This is the archaic entitled mentality I spoke of keeping your country in 3rd world conditions. BVi needs outside investment & help! Lastly, the expats that own businesses all have a Belonger partner holding the trade liscence which makes things difficult. Look around acceptance, change and development are needed! Moved? You better get some sense! Bit of a right mess really isn’t it, just when you need stability and confident leadership… but I sympathize with these ministers that feel ignored and silenced by the Premier, he has only himself to blame and why he has deservedly earned his party the unfortunate title of “No Direction Party” let’s hope this coup doesn’t drag on long just get rid of him now and get on with things positively…. The Premier said he will not lay the document in HOA for it to become a public document. It doesn’t mean others in govt haven’t seen the document. Reading is fundamental. Are you saying that the back benchers and Opposition dont count? Why do you need their vote then.? How can they vote for a confidential when they haven’t seen it? My thought is this revolt is part of a bigger plan. Look at the behavior of the two baptist preachers. They protest only a few of the government members and say nothing about others. The ones who are their friends get a free pass. Then look at what Mitch does as well in the House. All part of the plan. Did anyone listen to the prayer from pastor Mel yesterday. That seem to be more about throwing words at certain members than praying to God. When you come to the House to pray I believe you should just pray purely and leave. Then look at who are the two newly elected heads of the NDP – Delores son and Mitch brother. BVI people watch what is going on here. It’s all a big plan for power! This matter should have been handled 6 months ago or even after they trotted off with the documents to give to the UK (as a draft proposal). It is prudent that the backbenches and all members of the HOA are on the same page when it comes to the loans being initiated to help in the recovery plan, this is the future of the BVI. You can’t go into a car dealer and just buy a car without asking a few questions on the speed, maintenance or reliability before dishing out your cash or even getting a loan from the bank, so WHY does the public feel that they should vote YES when all the details of what is being offered have not even been discussed. This government in the sun needs to get its house in order fast. Hurricane season is fast approaching and whilst a great mask of open of business may been placed on the outside, the inside of this country is dying a slow death. Wakeup my BVI people, this ship is sinking! And the captain going down with it. The BVI belongs to the UK whether we approve the agency or not. Stop dreaming and cut the bullsh-t! The BVI is a dependent Territory and I’m sure if we want to cut all ties, the UK will provide a sharp knife or scissors for us to choose from. Agency or not the UK still guarantees the BVI’s borrowing so I’m not sure what the hoopla is about. how much times can I like this post??? Instincts but if the finances of the territory are in UK hands for a long while then GOOD! The people are fed up with this place pretending to be “nature’s little secrets” and “a global financial hub” when nothing works, every damn project gets handed to the same ex-criminal Big shots who hold all the capital, plant equipment, real estate and influential industries; and then, every damn project overruns it’s expense and timeline projections; and then, when it’s done, the quality is sub standard. All the while you have ministers owning properties in Oil Nut Bay, lord knows how many untraceable companies and accounts they’ve set up to funnel $$ paid in bribes, kickbacks, incentives out of the country. Everywhere you look corruption, which goes all the way down to the Labourer paid a little extra to keep he mouth shut. So if the BVI is dumb enough to choose poverty and thievery just because the thieves are our own, instead of a chance to leapfrog ahead as a territory and see real benefits with money going where it supposed to – well then my people more sick than I thought we were. We used to be an honest people. Now even a blind man can smell the dishonesty coming from within. The Recovery Loan you meant to say. However, the proposed agency will be managed by locals with a representative appointed by the UK. Now, please don’t tell me that you would personally guarantee a loan for someone (of that magnitude) without conditions? Also this fear tactic is redundant so please stop it people. Too late is the cry the backbenches should have stood up when the pier park was been overrun and when the bad spending was been done. Look the whole long and short is that the country’s infrastructure has to be repaired and the country does not have the money to do it. Tourism is stagnant and offshore finance is in trouble. The economy needs and injection of cash. If this money was not passing through the recovery agency would those opposing it have a problem. I think the answer is no. They who oppose have failed to demand that their peers who control the ministries to manage the finances of the country before it got to this point. And now elections are around the corner and everyone is pointing fingers at the premier and want to through him overboard. When in fact he is trying to protect himself and those with him including the opposition who made some bad decision on spending when they were in control. Lets not forget it is because of the VIP why the budget has to go to England before its approved. This is a power struggle and nothing to do with the Territory’s benefit. Of all things the back benchers should have stood up for this is it? We are not blind but they will feel the pain of these selfish decisions. I dont think many of us listen to HOA. And I also dont think our reporters report the news well enough. Most of the members do agree the loan is needed….the issue is the circumstances surrounding the loan. Yes we need it but also lets make sure that we do it the right way. And I do agree that time is being wasted. Nonsense! It’s a game being played and will backfire, just watch. Those in opposition have the responsibility to explain why they disagree, and to date none is willing to indicate specifically why they are not in agreement. They were not willing to stand up when other projects were being mismanaged to the point of budget overrun…but now that an agency to provide budget oversight/management is being introduced they have an issue? Precisely why I wish not to listen to what they have to say at this point. And unless he changed his attitude and leadership style, he will lead them to no where and off the cliff as he did VIP. The backbenchers have leverage but not sure if they are using it effectively; 6+5 equal 11. Lopsided governments are cocky and dictatorial. A government with a strong Opposition or a coalition governmnent works better. Let me get this right; so the UK is willing to back a loan for the VI which will see us paying it back at a significantly reduced interest rate? and the so-called agency will be headed by a local? and we all agree that we really need the loan? and those opposing have not put forward a logical alternative? and the agency is just for the VI rebuild initiative, not the overall governance of the territory? and the issue is? My personal feeling is that these politicians want to have control of the funds so that the could spend in accordance with their track record. I with the doc on this one! I have lost faith in these politicians – government and opposition – to manage this money prudently…to put it mildly. Please don’t hold our recovery hostage. Also, if you disagree please tell us what exactly you are in disagreement with and provide a suitable alternative, otherwise vote for the darn agency and let’s get the ball rolling. God bless you Curious,you hit the nail on the head. Who you is, whey you from and wat you smoking? Ok. Here are some facts. One, the NDP poorly handled the Recovery Plan with the UK and Residents. Two, the BVI was devasted by 2 monster Cat 5 catastrophic hurricanes, Irma and Maria, along with a historic flood. Three, the BVI needs hundreds of millions or even billions of dollars to rebuild/recover. And four, the full HOA should have been briefed on the Recovery Plan before presenting it to the UK. That said, regrettably the deal is signed so the HOA members needs to work collaboratively and cooperatively, along with partnering with UK, to repair the faulty agreement. Yes, it will be embarrassing, for assuredly the UK thought that the BVI government had dot the I’s and cross the T’s with residents and their represensatives. Perhaps, the UK should have asked a for a majotity motion from the HOA supporting the agreement; with an 11-2 advantage, this should have been easy. Moreover, it was suggested that the BVI borrow from internal lenders. True, that is a funding source. But does local lenders have hundreds of millions to lend out, reserve requirements aside? Will government borrowing crowd out other local borrowers, ie, property owners rebuilding from storm damages? Is not external investment the life blood of the BVI economy? Will not UK guranteeing of the $400M result in a much lower interest rate? Yes. Is the the guaranteeing sum paltry? Yes. By the way, is the Hon Christian a junior minister? Bvi people are so silly… always want something for nothing. All yall lived like we in a hurricane free zone and were careless. Now yall willing to sell your land, soul and backside to go back to the same monkey mentality. Pull up ur dam pants,roll up ur sleeves and become real nation builders! If I were premier Smith I would have done just like the previous UK Prime Minister. My members of government are against my decision so I resign. Simple! The premier don’t have to take all these embarrassment at all. It is one thing to disagree and quite another to suggest a viable alternative.They are saying,borrow locally .At what rate . Who is going to guarantee the loan? It is so sad to see these backbenchers following Fraser.Don’t they know that he is trying to divide and conquer in order to form his —– ? Does Alvarado and Delores believe that people will vote for them after this,especially if they run with Fraser whom everybody —- ? They need to use their heads. Something sinister is going on and it is not about this loan so Pay Attention. The backbenchers with certain individuals in their ministerial collars and a shady ——— ——- whispering in their ears for years now blatantly vilifying the BVI internationally:paying his unpayable debt. This thing is not as simple as it seems.. A web with international contributions … catastrophic. This is the opportunity to ameliorate and destroy a successful black economy. Pay Attention. I am sitting here reading all these blogs and saying to myself “Thank God, God is not like man”. If our elected Government had brains like some of you Bloggers, the Virgin Islands and everybody in it would have been gone to Hell long time and wouldn’t be here blogging nonsense. If you people would step back, think and look at the big picture you would have better understanding of the consequences of those in authority whether they vote for or against such a bill. I stand corrected but i fully understand what the stakes are. Some of you are saying Go ahead and vote and let the chips fall where they may because you are only seeing and smelling MONEY. The love of money is the root of all evil and most of you are evil-minded. No apology. Is our Premier a Government unto himself? Did the UK asked for the information to be held as a secret from SOME of the Honourable members or is our Premier deciding this on his own? Do you think our Premier could or would keep such a secret this information from his Senior Ministers? I am amazed that a personality like the education minister is not against something like this. This says to me that there is more in the mortar besides the pestles and ALL of us may be surprised at the secret. Yes, we need lots of money to get our territory back to normalcy but at what sacrifice? what is this big secret and why aren’t YOU the people scared? Because all you are seeing is thee Money, the Money. Would we die if we don’t get this money? ask yourselves this question. If everyone of them vote “Yes” and after that we all learn what the big secret was and they should have voted “No”. What would you said then? They should have known better or they should have more intelligence than us. Would you if you were in their positions vote for something without having all the needed information? If you say “Yes” that is the reason you are where you are at. If you say “No”, I applaud you and again I implore All of you to Stop, Look and Listen. Hon. Christian, every day I am learning a different side of you and it is a good thing. In All your ways acknowledge God and He will direct your paths..
Who is the Government Whip? Well those Back Benchers need to get in line!!!! They are an e————t to these Virgin Isles. Strange Bedfellows indeed….These are the same people who had the representatives for the third and first to be all but the Devil reincarnate and now they are making moves to side with the opposition? Undermining their leader at this important time? Mr Christian need to be stripped of his junior portfolio when the dust settles….We the voters will do the rest!!!!! Unbelievable.!!!! The Premier is too accommodating and trusting for his own good; a long time ago he needed to exert strong leadership by walking softly yet carrying a BIG stick. Some members of his own party see his kindness and generosity as a weakness to exploit and disrespect. Many have been calling for a long time for a ministerial reshuffle yet he refused at his own demise and peril. Some members of his party see his days as being numbered and are behaving and acting in their self interest. They cannot give a rat’s a-s about senior leadership; they are positioning themselves for their future in a M———-n way, ie, by any means necessary. Nonetheless, the Premier errored in how the recovery plan isssue was processed; process is important. Passing legislation is like making sausage; it can be a slow, meticulous and an engaging process. In constructing this legislation, some of the sausage making steps appeared to have been skipped. The Premier made the assumption that because of the crisis that the BVI is in he could skip some steps. However, he miscalculated that people often act out of self interest, not in the public interest. Undoubtedly, the BVI, having been decimated by two exceptionallly strong Cat 5 hurricanes (Irma and Maria), needs to borrow money to rebuild. The damages are estimated in the $BBB. Consequently, the BVI needs to borrow $MMM to reconstruct. The UK extended a helping hand by guaranteeing a $400M loan. Problem: terms and conditions for the loans require a establishing a board/agency to manage any recovery loans. Many are of the opinion that the Board is proof that the UK is troubled by the fiduciary performance of the BVI government. Further, the Premier did not fully consult with the populace and represensentives before getting the UK to ink the agreement. In hind sight, lack of consultation is creating a fire storm; a political storm on top of weather events/storms. Was this political storm a self inflicted wound? Furthermore, some of the Premier’s mates are openly disagreeing with the action that he has taken in regards to the recovery plan, particularly the Board. The BVI is in crisis and needs all hands on deck pulling the wagon to progress out of this crisis. Unity is needed. As such, if I were the Premier, I would call a snap election to give voters the opportunity to elect the team they want to lead the territory out of this crisis. Ageed! Call a snap Election. Let all votes be counted. Let rhe people decude. Snap election with what parties other than the NDP? If a sneak election is called tomorrow can the VIP or anyone else field a team worth anything? What parties are out there for the electorate to consider seriously? Other than the NDP? When the loan is approved have the BVI Airways planes fly the money into the BVI’s! OH, we don’t know where the planes are? Probably the same way the loan money will go! UK withdraw the recovery loan pending the outcome of the election. If VIP wins then VIP decide the funding source for recovery including negotiation with the UK. VIP can’t win all we will get is a coalition. All fools day soon come. Expect the house to be parogued and elections called. The next motion on the floor should be a vote of no confidence. The Premiere no longer commands a majority membership in the HOA and the Guv will have to do his duty. Orlando committed hari kari by taking this bill to the HOA well knowing he did not have majority support of his members. The voting on this bill will therefore be a referendum against him, his wife, and his brother in law. He took unilateral action on such a serious matter and will pay the ultimate political price. When the dust settles we will see where the chips may fall. I am of the opinion that this way would seal the fact that he stuck to his guns in his conviction about the best interest for the country. If the Gov intervenes it would show the VIP as being for self interest at the cost of the recovery and the economy. I agree that doing nothing is not an option, but making a blind decision is even worse of an option. Clearly some of you all have not been listening to the House of Assembly for the last 2 days and are just talking from opinion, instead of what was said and not said in the HOA.